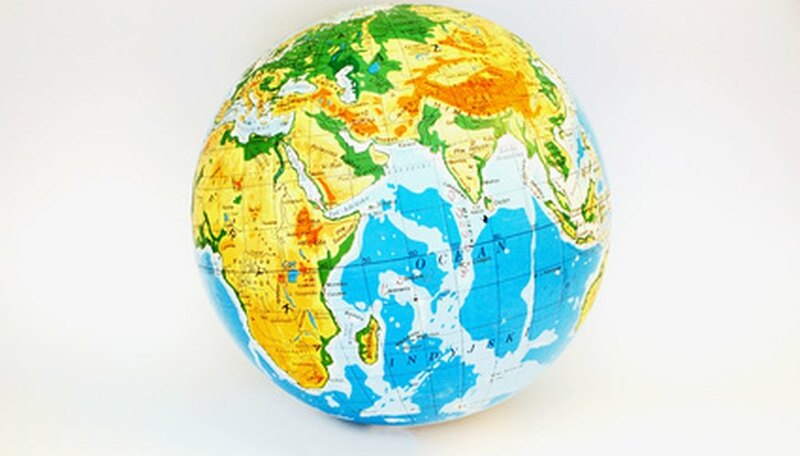 If you are teaching students about national or world geography, it is helpful to give the students some hands-on crafts to complete that will enable them to understand and see maps and globes in a new way. For example, students can construct a globe out of craft materials, which they can correctly paint and label with the world's landforms. They can also create a printable map that can be designed to feature world or national landscapes. Blow up a balloon, and tie the end. Pour 2 cups of flour and 1 cup of water in a pot. Heat the mixture until it boils, then reduce the heat and simmer the mixture for 5 minutes. Allow the mixture to cool completely. Tear pieces of newspaper into strips. Dip the strips into the flour mixture, and use them to cover the balloon in five to six layers. Allow the balloon to dry completely. Pop the balloon with a straight pin. Draw out the landforms on a standard globe onto the craft globe using a pencil. Paint the craft globe using acrylic paints. Use blues for the water and browns, tans and greens for the landforms. Allow the paint to dry completely before displaying the globe. Open up your graphics program onto your computer. Open a new file into your graphics program by clicking on "File," then selecting "New" from the list. Fill in the dimensions in the pop-up window that appears. Type in 12 inches for the height and 15 inches for the width. Click "OK" to open the new image. Add cities or towns onto the map by using the Shape tool. Select the Point tool, then make the point larger using the adjustment tools at the top of the screen. Click onto the image to place dots, which will represent the various towns or cities on the map. Make the smaller towns and villages with smaller dots and the larger cities with larger dots. Draw lines connecting the towns and cities using the Paintbrush tool. Once selected, hold down the mouse button to manually draw out the connecting lines between the dots. Print out the map, then draw on landmarks, mountains and trees using colored pencils.